Collaborate Corporation Limited (ASX:CL8) confirms that it has issued the following fully paid ordinary shares under the controlled placement deed with Acuity Capital. Collaborate Corporation Limited (ASX:CL8) is pleased to announce the execution of a controlled placement deed with Acuity Capital for up to $3 million of equity over a 30-month period. 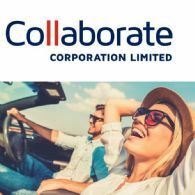 Collaborate Corporation Limited (ASX:CL8) is pleased to release a copy of the Investor Presentation in advance of Collaborate&apos;s presentation to attendees at the Canary Networks Stocks to Watch Roadshow event in Sydney on 29 November. 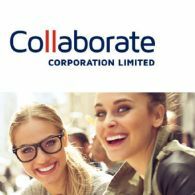 Collaborate Corporation Limited (ASX:CL8) (Collaborate or the Company) is pleased to provide an update on performance and key product launches in the December 2018 Quarter. 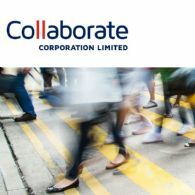 Collaborate Corporation Limited (ASX:CL8) is pleased to advise that it has issued a further 800,000 fully paid ordinary shares at an issue price of $0.015 per Share under the Shortfall Offer pursuant to the entitlement issue prospectus dated 14 September 2018, following the reinvestment by certain non-related party underwriters of underwriting fees and interest on advances paid to them. Collaborate Corporation Limited (ASX:CL8) is pleased to release a copy of the AGM Investor Presentation to be provided by Mr Chris Noone to shareholders at the Annual General Meeting to be held in Sydney commencing at 3:00 pm AEDT today. The AGM Investor Presentation will focus on the strategy and initiatives of the group.